The redevelopment of Atlanta’s Peachtree Center – a 2.3 million SF development featuring office space, retail shops, restaurants and three hotels – marks a progressive shift happening in urban Atlanta. As the ninth largest city in the U.S., with a population teetering around 5.8 million, the city and developers are looking for opportunities to connect with new residents and reengage Atlantans. So, how does one reimagine an iconic city space, which also happens to sit in the heart of downtown’s most active transit center? The answer is simple: through a singular vision and the unabashed use of technology to guide transformation. Banyan Street Capital, owner of Peachtree Center, approached The Beck Group with a vision to modernize the center’s plaza and shopping experience. For those unfamiliar with it, Peachtree Center is a quintessential, but dated shopping and dining experience. It is frequented Monday through Friday, by those who work in or visit downtown for business. Beck’s task was to design and build a “Hub” that is inviting and modern. The type of urban mixed-use center where office tenants can enjoy eating and shopping, but also create an amenity base for those looking to make downtown their home. As Beck completed design work on “The Hub,” the team leveraged its Virtual Building Group to enhance how the client experienced the project. Rather than present two-dimensional drawings, the team inputted the design into a full-fledged virtual reality experience for Banyan. “We often use VR in our projects. 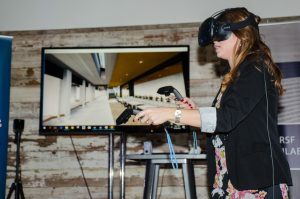 What makes it unique is that we use it validate both design and construction for ourselves and for our clients,” says James Norris, director of Beck’s Virtual Building Group. Presenting the designs virtually was a success. It created excitement for the final design, which is optimized for a pedestrian-friendly flow. A distinct, glass-enclosed staircase connecting to retail, art displays and unique lighting were just a few of the design features evident in the virtual tour. Seeing major design elements virtually also helped solidify decisions for the client. The exterior water fountain includes seating in the plaza, which happens to rival the size of Rockefeller Center. The virtual experience was so successful that Beck helped Banyan coordinate a tour for brokers. The idea was to grow interest and give brokers an understanding of how “The Hub” will serve the area. The reality is that consumers now expect accessibility at their fingertips. Developers and brokers are taking note, as modern spaces must offer it all –eating, drinking, working and playing to be competitive with other neighborhoods in a city. “The Hub” is proving to be the progressive shift downtown Atlanta needs. The first five restaurant openings were recently revealed and are launching in the upcoming months, with more announcements expected as Beck continues transforming the space.